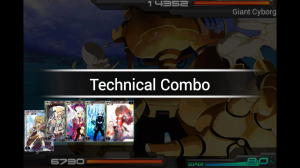 Million Arthur, an immensely popular mobile card collecting game in Japan, has finally hit the app stores of out mobile phones here in South-East Asia. 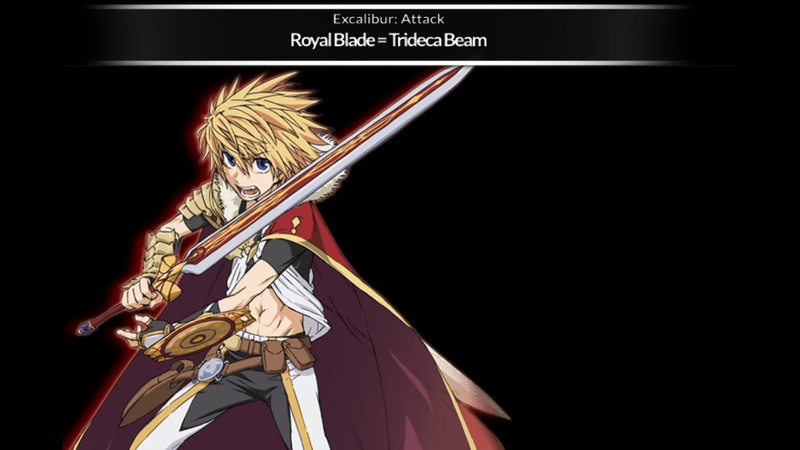 Whether you’re a fan of anime, card games or just like a well fleshed out story in general, there’s something in Million Arthur for you. 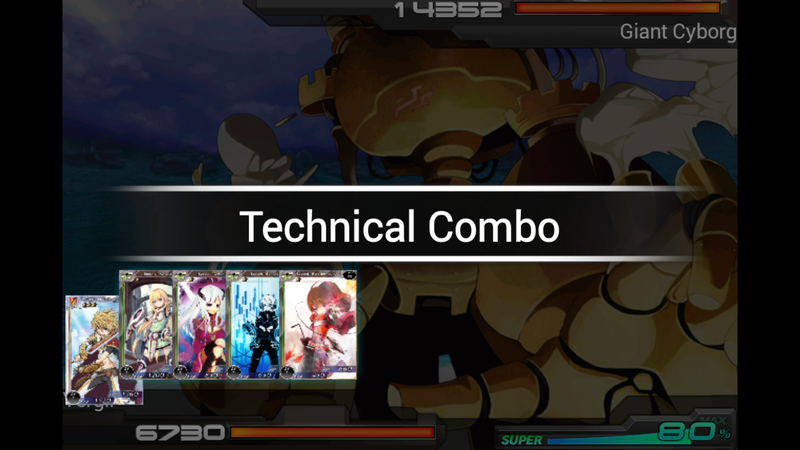 Fantastic art is what makes Million Arthur special among the slew of mobile games in the market. Names like VOFAN, BUNBUN, Nitroplus are among those who contributed card illustrations to the game, and they did an amazing job. No one would fault you if you sat in the gallery just admiring your cards in their full glory. It wouldn’t be a surprise if your goal in this game is to collect them all. Adding to that is a fully animated opening, complete with music, dark foreshadowing and battle scenes, like your traditional anime opening. This is an unexpected treat, a nice deviation from the norm of jumping straight into the addictive gameplay. Merlin, what are you doing in the evil mastermind’s light? The story is quite straightforward. 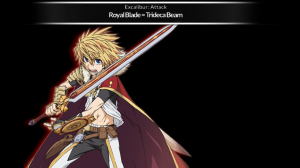 You are Arthur, the knight chosen by Excalibur, rightful ruler of Britain. However, you’re not the only one. There are many other Excaliburs, and many other Arthurs; about a million. Your job is to defend Britain from outside invaders, while fighting other Arthurs to be the strongest Arthur of them all! But you can’t do it alone. This is where the cards come in. Cards represent knights, loyal to King Arthur (that’s you), each with its own lore and special abilities. You form a deck using these cards, and they become your personal army. Cards have synergy bonuses with each other; having cards from the same faction in your deck will grant helpful bonuses, like increased health or attack. 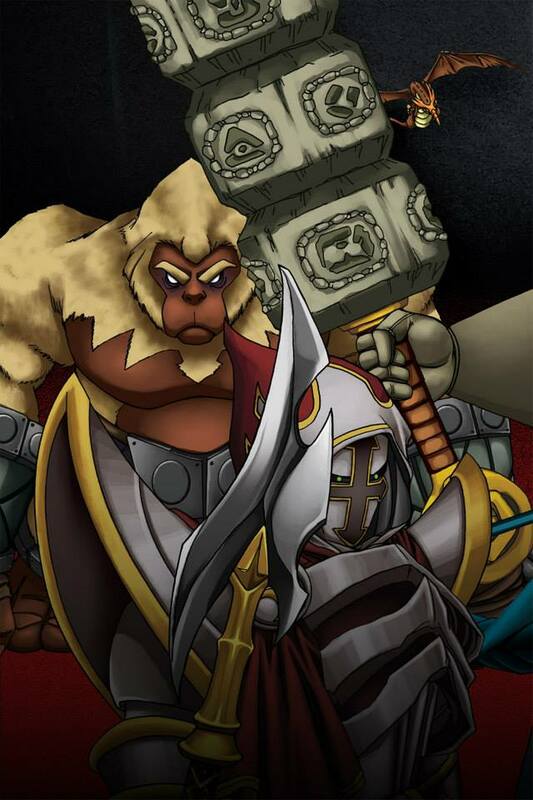 Once a deck has been formed (manually or by using the Recommended Deck option), you are ready to take it into battle. 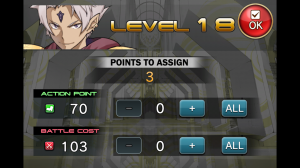 The battle system is completely automated. All you have to do is to sit back and watch the battle unfold. When your super meter is full, your chosen Arthur performs a special attack unique to his class, also beautifully animated. Warrior Arthur is fully pumped and ready to go! 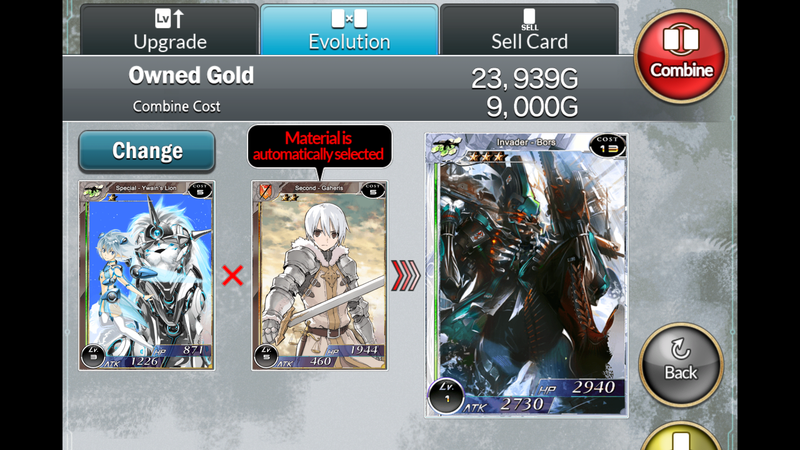 There is an option for you to combine certain cards together to create all new cards. It’s similar to the function in Shin Megami Tensei IV, where you can combine units you don’t need to create powerful units. It’s an interesting mechanic, so your collection doesn’t flood with cards you don’t want. 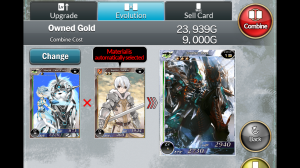 You can also sacrifice cards to power up your existing cards. Girl with Lion + Allen Walker look-alike = ROBOT ALIEN DESTROYER. The other part of Million Arthur is ‘exploration’. 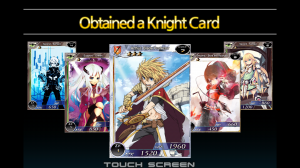 When exploring, you gain gold and experience points, along with the chance of receiving a Knight Card. However, you may also happen across enemy Faeries along your journey, which you can choose to fight or just ignore it for the time being. Defeating these Faeries will net you cards, gold and experience. 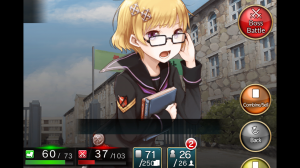 Arthur’s most dreaded enemy: the schoolgirl! Both of these actions require points; battles need Battle Cost (BC) and exploration costs Action Points (AP). 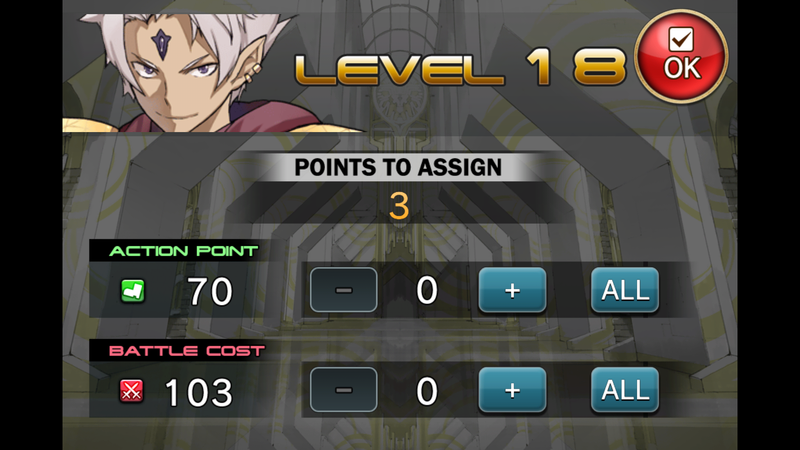 When you level up by gaining enough experience points, you are given 3 points to allocate as you see fit to either BP or AP, raising your maximum point total. The other way of increasing your maximum points is by adding friends. Each friend you add also gives you 3 points, similar to a level up. Friendship is magic, magic is power, power means more points! You will inevitably come across an opponent you cannot defeat alone. Your friends can join in the battle, each contributing his or her amount of damage. When the foe is defeated, each participant is rewarded for joining in. 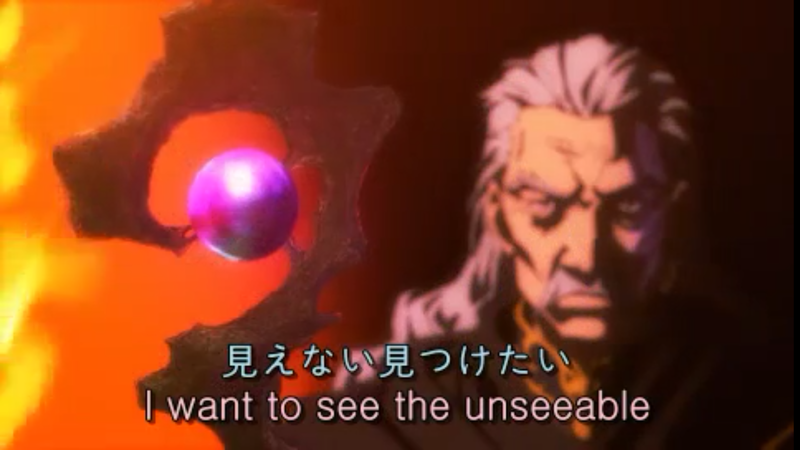 But there are more enemies than these random encounters. In the story mode, you get to fight predetermined bosses, all while experiencing the fully voiced dialogue between characters, in Japanese of course. The characters are well developed, with very interesting personalities. Someone’s in a Lot of trouble. However, no matter the outcome of your story battle, the end result would never change. Most of your battles leave Arthur winded and tired, even if you one-shot the enemy, or even if Arthur wasn’t even in the battle. It would have been nice if how you ended the battle affected the following conversation. 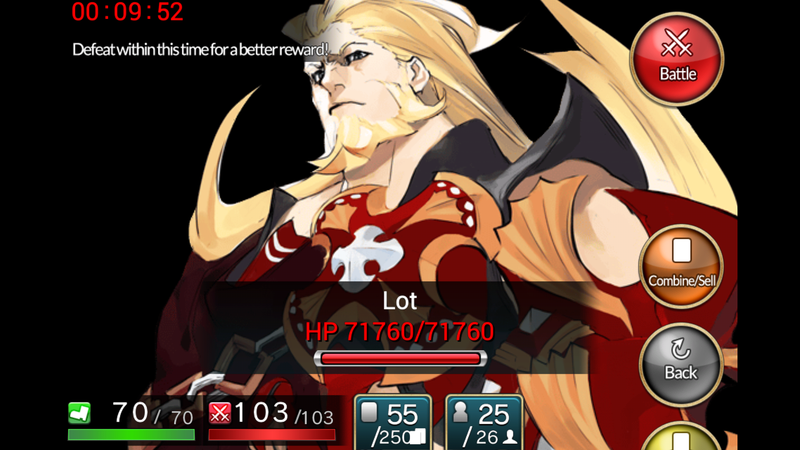 There are still features that are to come to the South-East Asia version of the game, like guilds and potentially guild battles, and that may increase the longevity of the game, but even in its current state, it’s still worth your time. 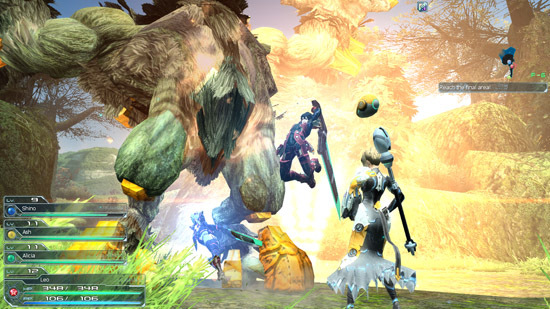 PSO2 goes English, and we love it! Asiasoft announced that they were publishing Phantasy Star Online 2 in English (PSO2) about a week ago, and just this afternoon, I got several hours hands on with the game during a closed door media preview. Having already tried the Japanese service, I had some high hopes. This was a Sega title, after all. For the uninitiated, PSO2 is an MMOARPG (the ‘A’ here stands for action, in case you were wondering) with console style graphics and aesthetics where you play an ARK recruit in a sci-fi setting. With the customization options, you can pretty much adjust anything. Well, almost anything. ARK recruits are essentially the equivalent of space cadets, and once you’ve customized your character (and the level of customization is quite comprehensive) and picked one of several races and classes (with localized archetypal names of warrior, ranger, and wizard), you’re thrust into a fairly deep and involved story line with all the hallmarks of a classic JRPG. The good thing of course is that the game can be played solo or with friends, and features instanced dungeon maps linked to a central hub. Friends, naturally, make things go a whole lot smoother. Beat on alien life-forms, steal their treasure, have fun with friends. Now, on to the localization. One of the biggest challenges I’d expected this release to face was the dialogue and the VOs. The original Japanese cast included some top name seiyuu, and matching up would be a tall order. It was a pleasant surprise when I discovered that rather than dubbing the NPCs over, the company had chosen to streamline the written dialogue instead, without compromising any of the nuances from the original. And that, of course, was a win in my books. Needless to say, PSO2 is a game best experienced, and with the Beta test coming up 10th to 13th April, we’re giving away some Beta keys to a few lucky readers who live in Singapore, Malaysia, Thailand, Indonesia, Vietnam, or the Philippines. These keys will also give you early access when the game goes live sometime in the next two months, so be sure to check out our Facebook raffle for more details! You can also keep tabs on the latest developments PSO2 in English developments through their official Facebook page. When we were invited to help S2 Games bring characters from their second generation MOBA Strife to life through our cosplay, we were thrilled. We’d read the Strife comic preview, and while Angelus had gravitated towards Minerva, I’d fallen instantly in love with MidKnight. The High Marshall from Tempra had made a pretty big impression. Here was a complex character with a villainous streak, and in some really sweet armor, no less. The only catch – he wasn’t a playable character in the Beta yet, so there were no released game assets we could use as a reference. With the character designer’s blessings though, we got the greenlight to go ahead, using a combination of the comic art, some sketches, and a few concept renders as the inspiration. 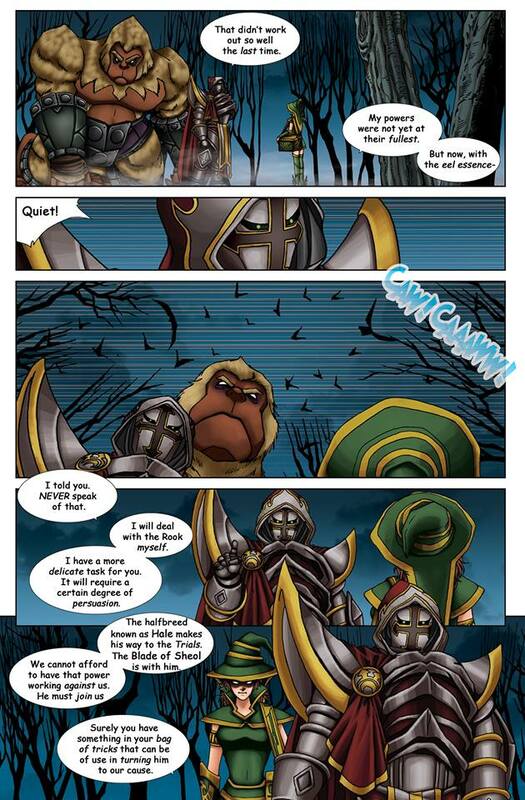 MidKnight, as featured on the back page of the Strife preview comic. Another image of MidKnight, this time from the second chapter of the comic. With so many references to choose from, we decided that we would aggregate the best elements of each of them, and started working on crafting armor pieces out of foam. Foam building might seem pretty arcane at first, but a lot of it is really about visualizing, drawing and cutting out the right basic shapes. 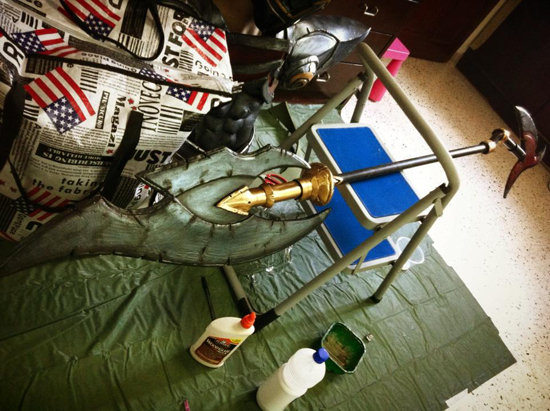 Creating curves, details and textures on armor is probably our favorite part. Foam is an incredibly versatile medium, and because it’s so pliable, is capable of forming some really interesting shapes. 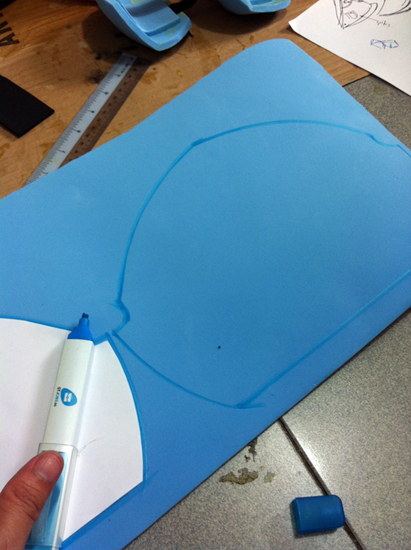 We’ll break down the shapes into temporary paper patterns, and replicate them on foam with a highlighter or marker. We then cut them out, and paste them together with contact glue. 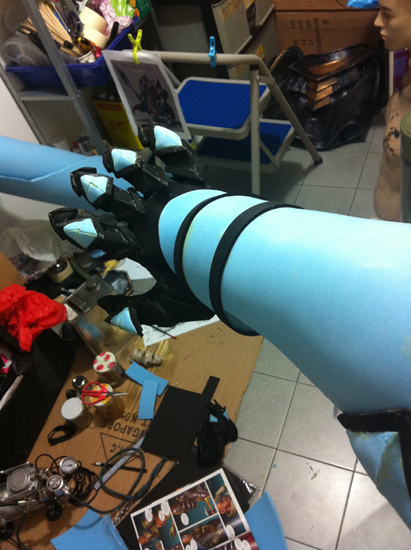 The gauntlets were built from EVA foam of varying thickness and a pair of satin gloves. 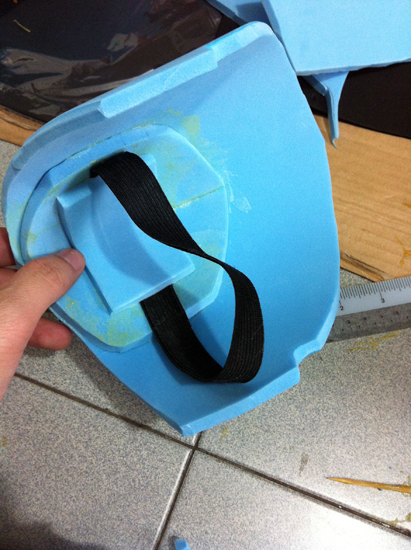 Adding elastic straps to help secure armor pieces in place is a pretty big part too. Creating the individual pieces took the better part of two weeks. 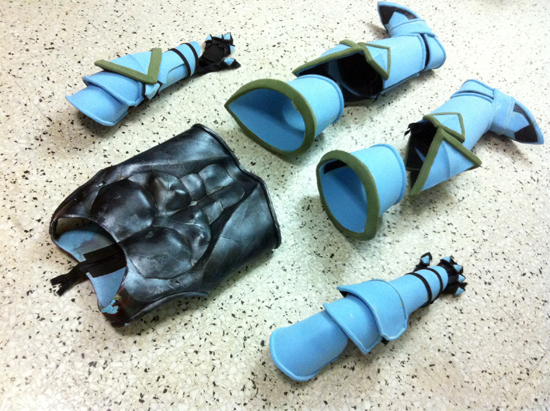 Here’s a look at some unassembled armor pieces, placed side by side for comparison. 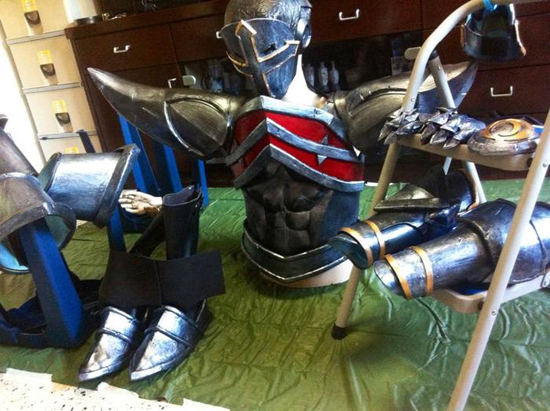 Various armor pieces. 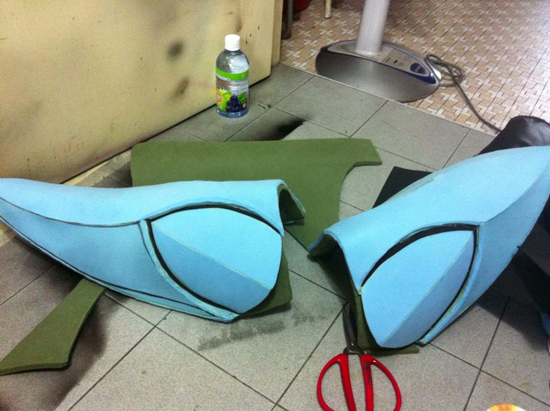 Only the chest piece is painted for now, and even then with only one base layer. 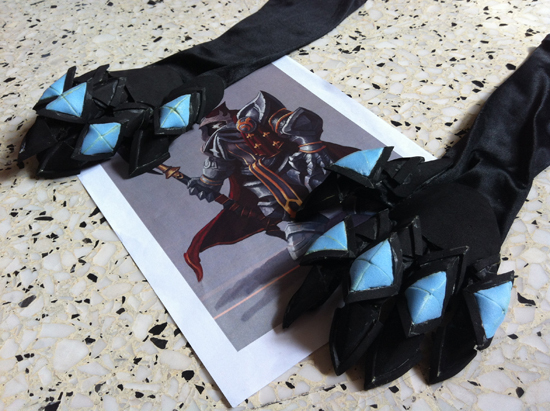 Pauldrons for the costume. One’s actually longer and curvier than the other. 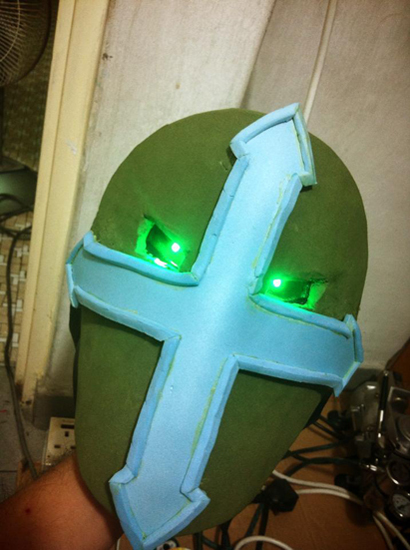 To simulate MidKnight’s eye glow, we incorporated LEDs into the helmet. And here’s how it looks with a proper paint job and embellishments. Like Minerva, MidKnight is also a pole arm user. We designed his weapon in three parts, so we could dismantle it for easier shipping. MidKnight’s weapon, also made out of foam and rubber. 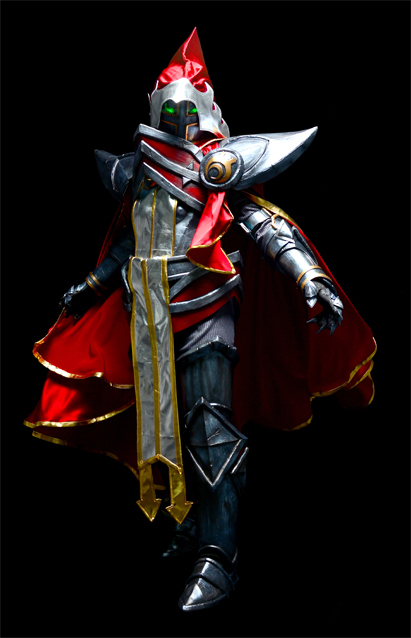 MidKnight’s costume also entails additional cloth portions, such as a tabard, cloak and costume base. Because he’s essentially a medieval knight, we felt that he should wear chain mail beneath the plate armor, and simulated the effect with some mesh cloth. 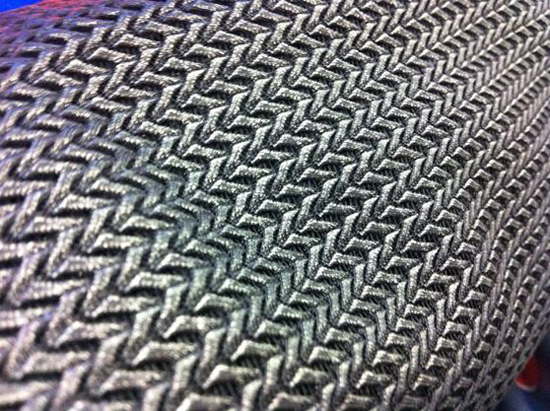 Mesh fabric – it’s a godsend for armored cosplayers who don’t really want to forge links the old fashioned way. We also utilized some really drape-y fabrics for the cloak so we could convey a sense of majesty and volume when the cloak billows. Here’s the costume in action during our studio preview. What do you think? MidKnight will be walking the con floor on Saturday, so if you’d like to trade coscards, be sure to come say ‘Hi!’. We’ll be at PAX East next weekend to guest-judge the cosplay competition and promote for S2 Games in room 159, so be sure to look for us there too! To register for the S2 Games Open Cosplay Contest, click on the link here.